You could say it was nostalgia that inspired David Merrill and Jeevan Kalanithi to create the plaything of the future. Noting that modern-day games operate increasingly in the virtual realm, with the kinesthetic component reduced to the click of a mouse or tap of a screen, the two MIT Media Lab graduate students felt a fundamental absence--the physical interaction that comes from old-school toys like building blocks and board games. This was the impetus behind Sifteo cubes. 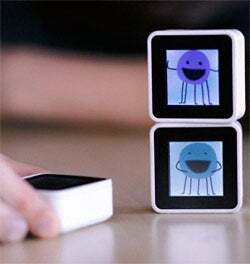 The little computerized blocks communicate wirelessly with one another and respond in varying ways to being pressed, tilted, shaken and rearranged--turning video gaming into a truly tactile experience. "It's taking the wooden blocks you grew up playing with and giving them this digital life," Merrill says. When Merrill presented Siftables, Sifteo's predecessor, at the TED conference in February 2009, video of the talk went viral, quickly racking up more than 1 million views. "That was kind of our Kickstarter moment--before there was such a thing as Kickstarter," Merrill says. "That was when we realized this was more than just a cool research project and that we really needed to take this idea to the next level and turn it into a product and build a company." Within a few months, Merrill and Kalanithi had moved to San Francisco, raised venture capital and assembled a team to help make their cubes and accompanying games ready for store shelves. That team is essential to Sifteo's success, Merrill says, but so is the recognition that "we don't have the market cornered on creativity." 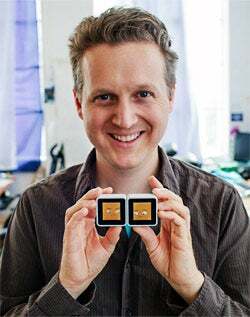 They've made it a point to connect with people outside the company for game ideas, forming partnerships with Richard Garfield, creator of popular trading-card game Magic: The Gathering, and indie developers like the folks behind the Bit.Trip games. They've even made their software-development kit available for free online and have hosted contests and "Game Jam" weekends to encourage amateur developers to invent games for the Sifteo system. "We really care about building play experiences that are beneficial to kids, that parents can feel good about," Merrill says. "It's not just entertainment for entertainment's sake." Many of the activities available so far are puzzle and word games that encourage problem-solving, but Sifteo owners can also play the curiously named adventure outing Sandwich Kingdom and a party game inspired by the iOS game Bloop. The latest version of the cubes came out in November. In addition to Amazon and other e-tailers, they're available at New York's MoMA Store, the Toys"R"Us in Times Square, select Barnes & Noble locations and Marbles: The Brain Store. One of Merrill's goals for 2013 is to expand Sifteo's retail reach. If people can get their hands on it--literally--he's confident they'll be hooked by what he calls "the magic of interactivity." The Everyplay platform by Applifier lets users record iOS mobile-game sessions and share instant replays--fun for gamers; effective advertising for developers. Playground Sessions is a gamified approach to digital learning that encourages piano players to keep practicing, with real-time analysis of progress--not to mention a blessing to Tiger Moms everywhere. With Playnomics, gaming companies can analyze game-playing behavior, applying the data to marketing and monetization purposes. The Zombies, Run! app uses storytelling, sound effects and goals like collecting survival supplies to turn a workout routine into an action-packed escape from the undead. YouEarnedIt is an employee-incentive rewards program powered by a SaaS platform: Each worker has a bank of points they can give to others, to be redeemed for rewards such as electronics, tickets and gift cards. Using cloud-based tools to encourage better living, higi assigns users a score based on health, fitness, lifestyle, activity levels and interaction with community and social network. Goalpost: Social gaming meets smoking cessation in this 12-week program designed to help people quit by completing tasks to earn points and participating in an online support community. Cloud-based platform Agawi enables publishers and developers to stream games on tablets and TVs, eliminating the need for PCs in gaming. Mindblown Labs' Mindblown Life iOS game teaches teens money-management skills before they get to college and start racking up real-world debt: They learn to earn and save, but also to incorporate balance (if their avatars don't stop working to eat, they starve to death).